We surveyed our team for their mealtime tricks for toddlers, babies and preschoolers to make life easier. Enjoy! Make applesauce or mashed butternut squash and freeze it in ice cube trays. So easy to store and defrost when you need it if you are starting solids. Color coordinated cups are great for safeguarding against germs, especially during flu season! Create a basket of quiet toys/books for older child(ren) to play with while you are nursing. Puzzle books, etch-a-sketches, playdoh, and small games all work. It’ great to have something to do with older children while feeding your baby. Put the “ears” up on juice boxes to avoid the grab-and-squirt. If you make instant oatmeal in the morning, microwave it, then toss in a handful of frozen berries and stir – it will be the perfect temperature for kiddos by the time you get it to the table. 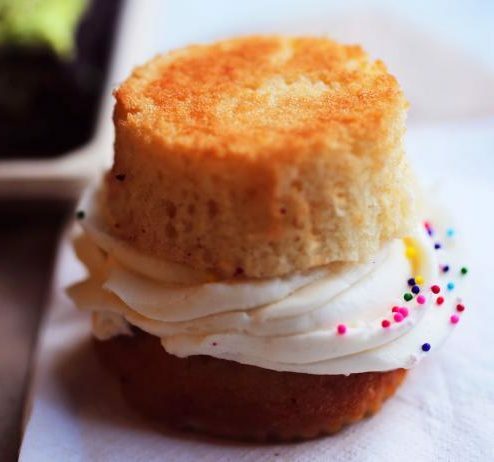 When eating a cupcake, break off the cake bottom, flip it over and put on the top.Then, you can eat it like a sandwich and it is much less messy and easier to eat. Picky eaters might enjoy “build-your-own” meals, including tacos, pasta, pizza, oatmeal, yogurt parfait, baked potato, smoothies, and more. Dips make everything better and more fun to eat for kids, and adults, too. Let your child dip his food in his favorite dip : ketchup, ranch, yogurt, almond butter, etc. When kids start school they are often too overwhelmed by all the socialization to sit and eat. If you are supposed to send a snack to school, try making a fruit and yogurt (protein packed!) smoothie in an insulated pop-up straw thermos cup. They can drink their nutrition quickly while still being able to be chatty social butterflies at lunch and stack times. Breakfast burritos, overnight oats, yogurt parfaits and egg muffins are all super-easy, protein-packed and healthy options you came pre-make in batches and store for the rest of the week. Try cooking with your kids so they get excited to eat what they made.